Guru-mantra is not just some words! 14 March 2018, Harisar Ashram, Kila Raipur: These days, almost every other soul is found to be dissatisfied about one thing or another. And that’s not it; here the point that needs careful attention is that we have absolutely no interest in finding the solution! We are happily unhappy in our own bubble, attracting physical or mental dis-eases just to die one final day. Well, with the onset of Chet, another month as per the Nanakshahi calendar, Sadhvi Ji addressed this sole worthy issue, by emphasizing on the importance of attending satsangas and thus trusting the practice of Guru-mantra to be the only answer! It is important that we do not miss any chance we get to attend Satsangas as they are like soap, helping us to get rid of the unnecessary waste accumulated in the form of negativity. However, we persistently resist, rather run-off or keep on postponing. Observe that even seasons change with time, but we, deliberately choose not to adapt and instead stick with the word tomorrow, which is nothing but an excuse. And at what cost, day-by-day deterioration of the health! We do not realize the significance of practicing Guru-mantra because if we did and yet there is no visible change (adaptableness) towards people, things or situations around, it would be like saying that even after standing next to fire, it doesn’t provide enough warmth or by being closer to a huge chunk of ice we are yet to know what does it mean or how does it feel to get cold. Understand, and digest this very fact that Guru-mantra is not just some words. They are like a seed having absolute capacity of getting shaped up in the form of a tree. And D-day we realize so is the day we would know it for sure to be our real wealth, a timeless and priceless gem. As of now, ‘trust’ is what needs to be solidified. How, each moment human mind needs some place to be at; why not direct it within our selves; again and yet again! Aren’t you tired of running all the time and yet reaching nowhere? Tired of holding grudges based on the past, worrying about future and therefore ruining your present? Then why not sit and meditate? Without surrendering unto Guru’s command, it’s not going to work! Choose to be fearless by being friends with Him, the ultimate minister just like we would be if somehow we get a chance to establish direct contact with the Prime Minister. So, 1) believe that we are here in this world to be one with The One, by doing service (sewa) and practicing Guru-mantra (simran). 2) While we are at it, let’s not intentionally do anything wrong, hurt, or misguide anyone. Hardships are bound to find their way towards us; choose to close eyes, and surrender to practice of Guru-mantra! It is a non-profit organization that doesn't profess allegiance to any religion. It respects and serves people from all walks of life, sects or creeds. It is a research ground where hidden secrets of spirituality are researched, applied and made available to the general masses under the able guidance of Mahayogi Swami Buddh Puri Ji. Sankranti of every month: Satsang at Kila Raipur Ashram near Ludhiana in Punjab, India. Last Sunday of every month: Satsang at Malke Ashram near Moga in Punjab, India. May 14: Satsang on Barsi of Swami Mewa Puri Ji at Kila Raipur Ashram. Jul 16: Guru Purnima Celebration Guru-Pujan and Satsang-Pravachan at Dera Harisar, Kila Raipur. 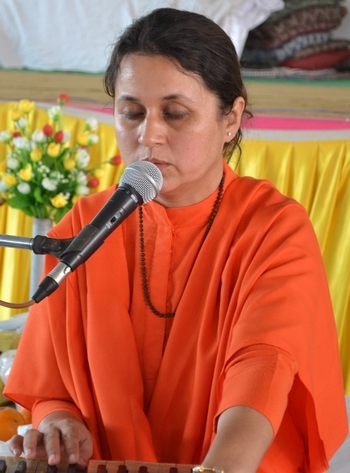 Sep 8-10: Sadhna and Satsang on the occasion of Nirvana Divas of Swami Dev Puri Ji at Kila Raipur Ashram. Oct 5-8: Navratri/Dussehra Sadhna Shivir at Malke Ashram followed by a grand satsang.